The British North America Act, 1840 (3 & 4 Victoria, c.35), also known as the Act of Union 1840, (the Act) was approved by Parliament in July 1840 and proclaimed February 10, 1841 in Montréal. It abolished the legislatures of Lower Canada and Upper Canada and established a new political entity, the Province of Canada to replace them. The Act was similar in nature and in goals to the other Acts of Union enacted by the British Parliament. The inspiration for the Act is typically attributed to Lord Durham's Report on Canada. Lord Durham was sent to the colonies to examine the causes of the Rebellions of 1837–1838 in both Upper and Lower Canada. Lord Durham wanted to re-instate peace throughout the colonies and recommended a political union. It was under his belief that peace could best be achieved by ensuring a loyal English majority in British North America, as well as by anglicizing French Canadians, and by granting responsible government. The union was also proposed to solve pressing financial issues in Upper Canada, which had become increasingly indebted  under the previous regime dominated by the Family Compact. These debts stemmed mostly from poor investments in canals connecting Upper Canada to the port of Montreal in Lower Canada via the Great Lakes and St. Lawrence River. Due to Upper Canada's considerable debt and chronic budget shortfalls, it was hoped that its finances could be salvaged by merging it with the then-solvent Lower Canada. Upper Canada, with its British and Protestant majority, was growing more rapidly than Lower Canada, with the French-Canadian and Catholic majority. It was hoped that by merging the two colonies, the French-Canadian cultural presence in North America would gradually disappear through assimilation. As such, the Act also contained measures banning the French language from official use in the Legislative Assembly. However, despite the amalgamation, the distinct legal systems of the two colonies was retained with Upper Canada becoming referred to as Canada West (with English common law) and Lower Canada as Canada East (with French civil law). In Upper Canada, there was opposition to unionization from the Family Compact, while in Lower Canada political and religious leaders reacted against Upper Canada's anti-French measures. The new, merged colony was named the Province of Canada and the seat of government was moved to Kingston by Lord Sydenham. 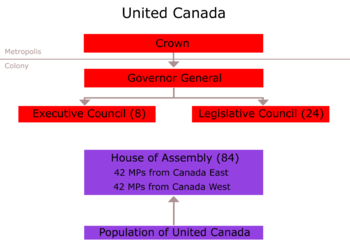 Canada West, with its 450,000 inhabitants, was represented by 42 seats in the Legislative Assembly, the same number as the more-populated Canada East, with 650,000 inhabitants. The French-Canadian majority, as well as numerous anglophones, considered this an injustice. In Lower Canada, Louis-Joseph Papineau demanded representation by population and the recall of the union the minute he entered the new parliament of the united Canadas. By the late 1850s, massive immigration from the British Isles to Canada West changed the previous demographic imbalance between the English and French sections of the colony. Many politicians in Canada West began to lobby for representation by population as they no longer considered the equal representation mandated by the Act of Union to be just. In the end, the Act of Union failed at shutting down French-Canadian political influence, especially after responsible government was granted to the colony. By voting en bloc while the anglophones of Canada West were highly factionalized, the francophones of Canada East guaranteed a strong, unified presence in the legislative assembly. As a result, bills proposed by one of the anglophone Canada West factions required the support of the francophone Canada East votes to be passed. This was known as the double majority principle and reflected the duality of the two administrations. The double majority principle was never officially recognized and was demonstrated to be impracticable. However, the francophone presence remained inferior to their demographic weight in the executive and legislative councils. The government of Lafontaine-Baldwin succeeded in repealing the measure against the French language in the assembly, in the courts, and in the civil administration. With the double majority principle, both Canadas were so to speak "reseparated" and for a short while, both sides were managed independently. Joint premierships shared by an anglophone from Canada West and a francophone from Canada East became the convention, but continual legislative deadlock resulting from the conflicting aspirations of the two Canadas remained. 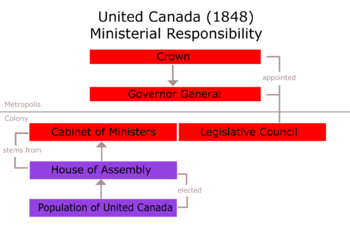 Dissatisfaction resulting from this deadlock was one of the main factors for Canadian Confederation in 1867. ^ The Short Titles Act 1896, section 1 and Schedule 1. ^ "Act of Union". The Canadian Encyclopedia. ^ ARCHIVED - Upper Canada - Towards Confederation - Canadian Confederation - Library and Archives Canada. Collectionscanada.gc.ca. Retrieved on 2013-07-12. ^ Canadian History. Flash.lakeheadu.ca. Retrieved on 2013-07-12. ^ Act of Union Archived March 14, 2013, at the Wayback Machine. The Canadian Encyclopedia. Retrieved on 2013-07-12. ^ "Quebec History". faculty.marianopolis.edu. Retrieved 2018-01-25. This page was last edited on 9 January 2019, at 15:31 (UTC).